Green anoles are the most commonly seen of the anole lizards in captivity. They are regularly exported from Florida and surrounding states. They are cheap to buy, but contradictory to popular belief are actually not ideal for a beginner. Green anole lizards are temperamental to their surroundings, and require the correct temperature and humidity to remain healthy. They are a short lived lizard, averaging around 4 years of age in captivity, however have been known to live for up to 10 years. Adult males are larger than females, reaching approximately 20cm, females only 15cm. Many people call these ‘Chameleon Lizards’, due to their ability to change colour. Whilst they are not able to change their colours so vividly as many chameleon species, they will turn a darker green / brown when either stressed or basking. The darker colour will raise their body temperature quicker when basking; once they reach their optimum temperature they will begin to turn green again. Most anole lizards are communal species, living in highly populated areas of perhaps hundreds of individuals. Males are highly aggressive towards each other when confined in a small terrarium with a number of females. However, a larger terrarium with a ratio of 1 male to 5 females is ideal. It has been published and said many a time that green anoles can live in a small terrarium with minimal requirements. I must stress that this is far from the truth, and will lead to a short lived, unhappy and unhealthy pet lizard. Although this is a small species of lizard, they are incredibly active and curious creatures. They need to regulate their temperature and have access to UVA and UVB rays normally omitted by the sun. Humidity is another important factor, this will help in the sloughing of their skin and generally aid in the health of the lizard. It is recommended that one male is kept to a minimum of three females. Alternatively, if you only want two or three animals, then just buy females. Green anoles are a communal species and should be kept in groups. Keeping a single specimen will deprive it of the much needed stimulation offered by the surrounding lizards. An ideal group consists of one male to five females. This size group should be housed in a terrarium L90cm x H90cm x W45cm. The larger the terrarium, the further you will enrich your lizards life. A larger group of two males to 10 females should be kept in a terrarium L120cm x H90cm x W45cm. 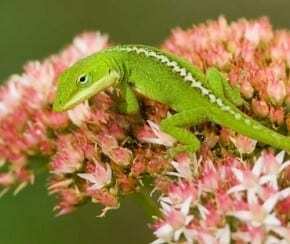 Many keepers choose to house their green anoles with other species, such as brown anoles (Anolis sagrei) and numerous day gecko species (Phelsuma sp.). This is not recommended for a number of reasons. Brown anoles for example are more robust than green anoles and will dominate the terrarium. It may not be so obvious, but the brown anoles will predominate the higher grounds of the terrarium, have first place under the basking site and may even push the green anoles aside when feeding. Day geckos can be rather aggressive and may nip the green anoles. A number of geckos are also nocturnal, meaning that at night time these geckos may literally walk all over the sleeping green anoles. This will add much stress to the green anole and should be avoided at all costs. There is one animal however which I feel will add good use to a green anole tank; that is an American Green Tree Frog (Hyla cinerea). These are nocturnal frogs which will help clear up any uneaten insects during the night, they cohabitate with green anoles in the wild and require the same temperature and humidity fluctuations. Green anoles, when kept in an optimum environment will breed readily; and therefore will need a deep substrate which is easy to dig in. Potting soil is ideal and is completely natural. With this substrate, it is also possible to place live plants directly in the substrate rather than placing them in pots within the terrarium. It is important to balance your planting and décor with space. Green anoles will often like to get out into open space along sticks and branches and onto open leaves to bask and get a good look at their surroundings. However, being able to crawl away into a bush to get cover is also a necessity. Be sure if using live plants not to use anything which is either toxic to eat, or releases toxic fumes. For a list of safe plants, see our plant list. As already mentioned; green anoles are a diurnal species and will bask in the sun. Therefore they need a basking site to reach their optimum temperature, and a light which emits UVA and UVB rays. Ideally, 2 or 3 basking sites should be set up in your enclosure. These should be simply 60W spot bulbs placed approximately 8” away from where the lizard/s will bask. By placing more than one basking site in the enclosure you will allow lizards to choose their favourite spot, and allow several lizards to bask in at the same time, as they would do in the wild. These basking sites should reach approximately 86-94˚F, allowing for a more overall air temperature of 80-84˚F and lower down in the enclosure, a cool area of approximately 74-78˚F. It is possible to replace the spot bulbs with UV spot bulbs. However, providing several of these is a very expensive on-going cost which is not necessary. Instead, place a UV strip light across the top of the enclosure. This should be as long as your enclosure allows, with a reflector behind it so that UV rays are not aimed in the wrong direction. UV bulbs should be replaced every 6-8 months, regardless of whether or not they are still emitting light. Do not use heat mats or heat rocks with green anoles. They are completely un-natural and serve no purpose. If extra heat is needed during the night time hours, an infra-red bulb will act perfectly. Coming from Florida and surrounding states, a high humidity range is a must. An ideal range is 60-70%, although fluctuations either way will rarely harm your lizard. This can be achieved in a number of ways. Firstly, a large water bowl placed as near as possible to a heat source will aid in the overall humidity. One step better is to then add air bubbles, commonly used in aquariums for fish. The bubble effect will continually circulate the water and burst small water vapours into the air. Similarly, a small waterfall will give the same effect. Offering plants such as bromeliads is another way to increase humidity. These plants hold water within the pockets at the base of the leaves, allowing for more surface area of water to evaporate. They also make a great addition for a display terrarium. Spraying the terrarium with cool water once a day, preferably in the mid-morning will certainly help the humidity, and at the same time allow the anole lizards to drink the water droplets that gather on any leaves or other surfaces. If you have a larger budget, a timed misting system will be perfect for when you are not around and would like the terrarium sprayed at regular intervals. These are becoming fairly inexpensive and are a perfect addition to a wonderful anole display tank. One word of advise though; direct the spray nozzles away from the front of the terrarium, as the spray will obstruct your view into the terrarium and the glass will need to be cleaned more often. Green anoles are predominantly insectivorous (insect eating). However, I say predominantly because they are also known to eat pollen, nectar and other tasty liquid type fruits. They may not eat a banana for example, but may lick the juices. Try offering your anole some of these tasty fruit options, if it eats it, great. Offering a variety of insects will stimulate the anoles natural feeding responses and aid in the general health of your animal. As we humans need a balanced and varied diet, so do anole lizards. Do not simply offer the same crickets all the time. Although there is not the best selection of foods available within the UK, there is still enough to satisfy the needs of your anole. Offer a mix between crickets, small locusts, mealworms, wax worms, small earthworms, small cockroaches, flies and even moths, butterflies and spiders you find in your own home. Not only will giving a variety offer a more balanced, nutritious diet, but will also make the anole adapt its hunting methods for each food item. An anole lizard won’t have to chase a waxworm, but will run like mad to chase a fly or daddy long legs spider. This will give your anole a chance to exercise and aid in the overall health and longevity of it. It is important to supplement the food with calcium and mineral dusting powders. This should not be done at every feeding, but at least once every two or three feeds. An ideal dusting powder is Repton, a specially formulated powder for insectivorous lizards. As long as this is combined with the appropriate foods and UV rays your anole should be perfectly healthy.